International Residential Code (IRC) Deck Building Code to change in 2015? The International Residential Code (IRC) revamped its deck building code twice recently, in 2009 and 2012. Additions included a prescriptive ledger fastening schedule, new lateral load requirements, and the acceptable location of fasteners on the ledger and house rim. However, the IRC is once again proposing changes to its deck building code. Any fastener or piece of metal hardware located within 300 feet of salt water needs to be made of stainless steel. All deck nails need to be helical or annular. The fastener spacing table will be updated to include engineered rim joist material. Framing details for beams and headers around chimneys and bay windows. New lateral load figures for joist offset of parallel joists, perpendicular joist blocking attachment, and attachment to concrete foundation or wall. Prescriptive requirement for 2 lateral load connections with a capacity of 1500 lbs. each at each end of deck. Revised figure for lateral load connection that provides for retrofit installations. Do you want to ensure that your new deck is up to code? 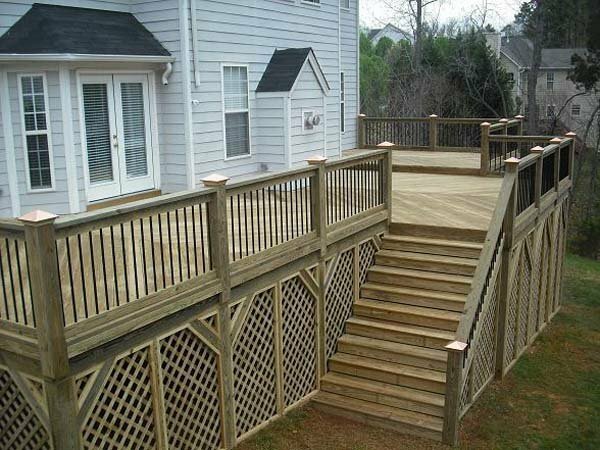 Then you need to trust the professional deck builders at Freedom Fence and Home. We have over 40 years of experience building high quality decks for both residential and commercial clients in and around Baltimore, Maryland. If you have any questions, please contact Freedom Fence and Home by calling 443-271-6841 or visit our website. Don’t forget to take a moment to browse our gallery of wood and low maintenance decks. Freedom Fence and Home: Your Maryland Deck and Fence Experts! You can also follow us on Facebook and Twitter! This entry was posted on Wednesday, February 27th, 2013	at 7:55 pm	. Both comments and pings are currently closed.